During a storm your ship was blown off course and you were shipwrecked on a deserted island. There are 3 other islands across the sea, but beyond that you can see nothing but ocean. As you start to gather materials to make a campfire, you realize that you will need to build a raft to sail away to freedom. Even when you have gathered enough materials to build a raft, you will need to prepare for what the island has in store for you; there are snakes, sharks, cyclones, tsunamis and much more to contend with… this paradise island is anything but paradise! 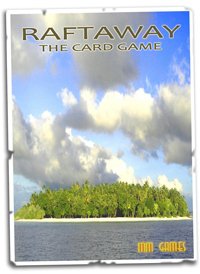 Raftaway is game for 2 to 4 players and takes between 30 to 60 minutes to play. Each player has been stranded on one of 4 different islands, which neighbor each other. The objective of the game is to build a Raft and have enough Health and Energy to sail away from the Island. The game includes Action Cards, Event Cards, Game Boards, and all of the various counters. All you will need to supply is 8 plastic markers (2 per player). Bill Mazon 10 10 10 Very fun and challanging game.